The French and German leaders have met in Berlin for the first time this year to discuss promoting economic growth, agreeing to sign a new “fiscal compact” and to reach an agreement on a financial transactions tax by March. 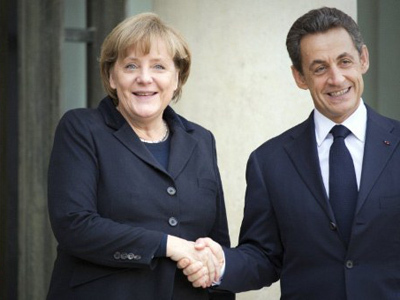 ­German Chancellor Angela Merkel hosted French President Nicolas Sarkozy, with whom she met on Monday to discuss ways to contain the Eurozone debt crisis. Greece was once again the main concern of their talks, with Merkel urging the conclusion of a debt restructuring agreement with Greek bondholders – a pact that requires bondholders to write off 50% of the Greek bonds’ value in return for a mix of cash and other bonds. The agreement is one precondition laid out for Greece if it hopes to receive a 130 billion-Euro bailout from the EU and the International Monetary Fund; another is an austerity program currently under development by technocrats in Lucas Papademos' government. In the meantime an internal IMF memo, quoted by Der Spiegel on Saturday, said Greece's economic free-fall has made international lenders’ plans obsolete. Last month, European leaders agreed to create a new “fiscal compact” that would allow Brussels to take individual member states to court if they exceed a budget deficit of 3% of national GDP. 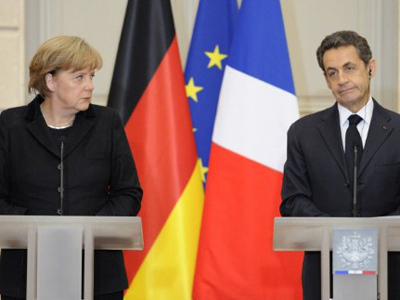 Merkel and Sarkozy have agreed on a March 1 deadline for reaching such an agreement. Another important issue discussed was the introduction of a financial transactions tax, sometimes called the “Robin Hood tax.” This would impose a tax on various financial operations including individual share, derivative or bond purchases. President Sarkozy spoke in favor of the idea, and his government is expected to propose the measure to the National Assembly next month. Sarkozy justified the tax by saying that since banks helped create the current crisis, it should be they – not taxpayers – who foot the bill. Merkel has also spoken in favor of the measure, but has said that she would only accept it once the rest of the Eurozone does as well. “Both Germany and France, Nicolas Sarkozy and I, consider a transaction tax the right answer, and we will continue to campaign for it,” Merkel said during the press conference after the meeting, emphasizing that finance ministers from other EU countries should deliver their verdict on the measure by March. Some analysts have argued that Sarkozy is rushing the tax, which he describes as a public interest measure, in order to boost his chances of reelection. The United Kingdom has been a vocal opponent of the financial transaction tax being imposed only on national or regional levels, saying it would only give way to the measure if it is introduced globally. 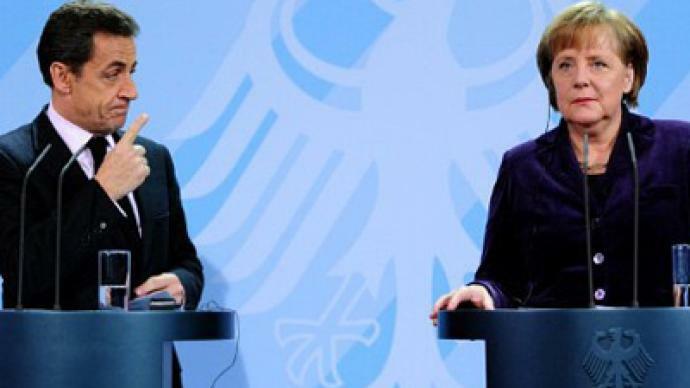 Merkel and Sarkozy also agreed to launch the 500 billion-Euro European Stability Mechanism, the EU’s permanent rescue fund, by July 2012, as Europe's existing 440 billion-Euro fund is considered too weak to rescue a major economy like Italy or Spain. 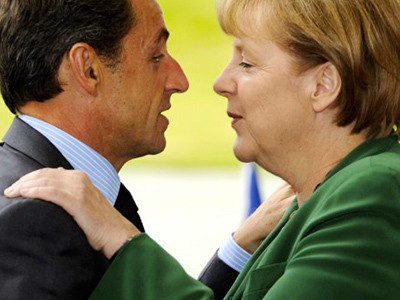 Further, Merkel and Sarkozy said that austerity measures were not the only way to get Europe out of a crisis. “Budget consolidation is one of the legs Europe’s future must be built on, but of course we need a second leg and that is … the question of economic growth, jobs and employment,” Merkel told reporters. They proposed using already-available European funding to support small and medium-sized companies and projects like expanding broadband Internet networks. Germany’s economy appeared surprisingly strong in contrast to the debt-ridden southern European nations on the eve of the Berlin meeting. Germany has managed to sell 3.9 billion Euros' worth of six-month treasury bills carrying a negative interest rate – meaning investors are willing to lose some of their money to make sure the rest of it is stored in secure German bonds.